God creates DNA and provides inherent instruction for a strand to duplicate itself. Depending on the type of cell (housing the DNA), somewhere within one and twenty-four hours a cell will multiply by division. On a larger scale, plants and insects, animals and people multiply. There’s a language for multiplication and the author is our Heavenly Father. In John chapter six Jesus fed a multitude of well over five thousand people with just two fish and five barley loaves. Obviously this is miraculous. With the help of C.S. Lewis I’ve been able to appreciate that, in a much slower way, God performs great and wonderful things like turning water into wine or multiplying fish and barley on a regular basis through biological processes. God's glory, love, grace, mercy, and control of time appears to be at the heart of the miraculous. 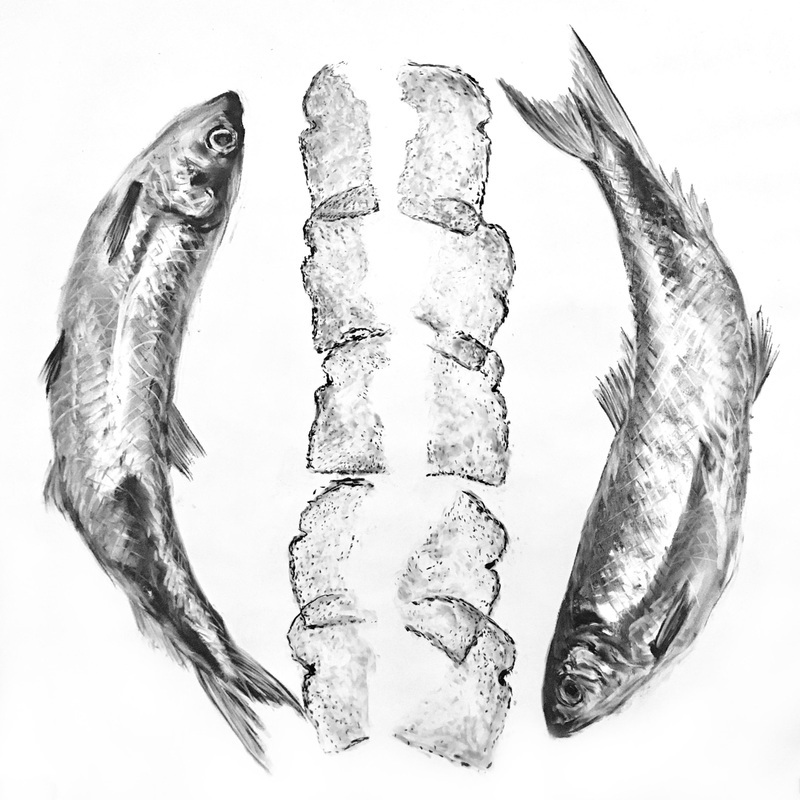 For this drawing I composed slices of bread (hoping a slice would be easier to recognize than a loaf from a distance) and two fish in a way that mimics the anaphase of mitosis (a part of a cell cycle). I don’t pretend to understand the miracle but I do believe that the same one who multiplied fish and bread to feed us also works in us to physically grow us and spiritually mature us. In John 6:35 Jesus calls himself "the bread of life" and he fills more than our stomachs. He bridges the "now" and the "not yet", he defines all other hungers for us, and he fulfills our deepest needs of meaning and belonging. He does this with abundance and it's been his style since the beginning of time.